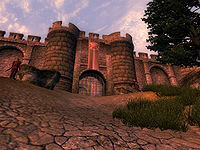 Battlehorn Castle is a large castle west of Chorrol that can be won by defeating the attacking marauders (plugin-specific). It is located at the western end of the Black Road and becomes your property after the quest of the same name is completed. The castle is added by the Fighter's Stronghold official plug-in. It is as large as any of the city castles, and contains, among other things, a main hall, dining room, the lord's private quarters plus various smaller bedrooms, a basement (but no dungeon), and battlements giving a picturesque view of the surrounding countryside. The un-upgraded castle is quite bare, although it does have a smithy where Niels the blacksmith can repair your equipment, along with one or two guards, assuming they survived the opening assault. Nilphas Omellian will sell you many upgrades for the castle. The castle comes with two men-at-arms. This upgrade improves security by supplying two more plus a commander for them. You can ask them to follow you and act as your companions in battle. If an accident befalls Castellan Athon, another captain (simply called Battlehorn Castellan) can be hired by visiting Nilphas Omellian and purchasing the Battlehorn Captain upgrade. Description: Furnishings for your private quarters and a maid, Rona Benanius, to look after you. The castle's master bedroom already has a bed but the upgrade adds a sumptuous double bed, a warm fire and all the creature comforts the lord of the castle should expect. The maid can provide you with any drink that the wine cellar has in stock, as well as cheese, grapes, strawberries, mutton, Shepherd's Pie, venison, and sweetrolls. She can also be asked to accompany you on your travels. The upgrade also adds three skill books: 2920, Morning Star (v1) (Blade) and Warrior (Block), which appear near the bed, and King (Blunt) which appears on a table on the balcony overlooking the Great Hall. The East Wing initially houses a set of three small tables set with cheap ceramics. For your 1500 gold you will receive a single high quality table and the finest silver cutlery and equipment. The room will be better lit and more warm and open for a true ruler. Description: An upgraded forge that provides a 15 point ability bonus to the Armorer skill when near it, it can only be purchased after at least one other castle upgrade has been purchased. Although the castle has its own forge from the start, the Dwemer Forge upgrade provides the Dwemer Fireheart greater power, acting as a 15 point increase to your Armorer skill, for as long as you are standing nearby. Because it is implemented as an ability rather than an enchantment, it provides the skill-appropriate perks at ranks 25, 50, 75, and 100. 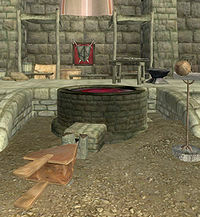 The Cook can provide you with any drink that the wine cellar has in stock, as well as cheese, grapes, strawberries, mutton, Shepherd's Pie, and sweetrolls. It is upgraded with a dead deer on a table to be prepared into a fine meal and bread baking in the wood-burning stove. Description: The library in the private quarters is filled with books, including several Skill Books. Although your private room has a few books to start with, the library upgrade provides a wide variety of new books, including two skill books: Heavy Armor Repair (Armorer), and History of the Fighters Guild (Heavy Armor). After purchasing the Trophy Hall upgrade, trophies can be created with the help of Melisi Daren. Each requires the appropriate creature's alchemical ingredient to create, and are completed at 10am each morning after which they will go on display in the Great Hall. The one exception is the bear, which she completes at 9am. She will only create one of each creature. Presumably for added realism, Melisi places a Nirnroot behind the stuffed wolf figurine. The wine cellar usually houses only a large vat containing 20 bottles of Mead. After purchasing the upgrade, it gains several other barrels: another large barrel containing 20 bottles of Cheap Wine and seven other barrels that will contain the special varieties of wine created by the vintner, Talan. These seven start empty. 24 hours after supplying Talan with the correct ingredients, one bottle of wine will be added to the relevant barrel. Although he only creates one bottle per barrel every 24 hours, he can actually create all seven varieties at once. When not making a special wine, Talan will gradually replenish the two large barrels, up to their 20 bottle capacity. One bottle of Shadowbanish Wine can also be found in the wine cellar. For maps of the castle, see Battlehorn Castle Maps. Not all of the containers in Battlehorn Castle are safe to store things in. Here is a list of containers within the castle that will not respawn. All of the containers inside the Private Quarters. The two boxes and chest in the secret entrance/closet to the North Tower. The three barrels next to the wine racks in the cellar. The lectern in the Trophy Room. The chest in the secret grotto. All sacks, including the ones in the Gatehouse and Kitchen. The rounded top chests in the Barracks and large servants room in the Basement. The gatehouse has a usable portcullis. There is an altar of Julianos in the Great Hall, to the right of the main door into the castle, which grants you Julianos' blessing when you activate it. Just like the altars in chapels, this will only work if you have visited a wayshrine of Julianos. The castle has three 'hidden' doors. The easiest can be found by exploring the basement - a door at the back of the wine cellar leads to a hidden pillar door on the main floor. The second is a hidden pillar door at the back of your private quarters. This door leads to a small 'storage vault' with 3 chests, 2 barrels, a box and a jewelry case. In the ceiling is a trapdoor that leads to the roof where you will find a steel bow, arrows and some mugs on a table with chairs, presumably for drinking and shooting from the roof of your castle. There is a journal on the top of a bookcase that leads you to the third secret door, behind the archery target in the weapons room in the basement. Use the unlit wall candelabra to the right to open the door. Travel through another hidden pillar door to fight the skeleton and lich that inhabit the castle's Grotto. Once all upgrades have been purchased, a chest appears at the foot of the bed in your private quarters. It contains the leveled shield Lord Kelvyn's Bulwark. An accidental change in the Battlehorn plug-in clears the ownership of the Mystic Emporium; see its page bug section for details. Both the note and the quest update about the forge claim it will cost 3000 gold, but in fact the base cost is 1500. The trapdoor to the roof of the gatehouse is on the outside of the northwestern tower, but the southeastern tower's is on the inside.